This small book is the appeal for world understanding of the oppression of the settlers in Texas by the Mexican Government dictator in 1835-36 and the reason behind the war for independence. TGS Historical Reprints put this back in print for the first time in many, many years. First published in 1836. It will be seen that the title of this little pamphlet implies more than it contains. 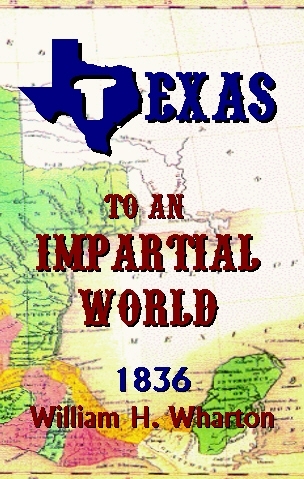 As war is now the order of the day, only a small portion of the political part of the work on "Texas" is here presented. It is hoped and believed that enough is unfolded to convince the most incredulous that the colonists of Texas have been 'forced' into this contest with the mother country, by persecutions and oppressions, as unremitting as they have been unconstitutional. That it is not a war waged by them for cupidity or conquest, but for the establishment of the blessings of liberty and good government, without which life itself is a curse and man degraded to the level of the brute. If the time-hallowed principle of the Declaration of Independence, namely, "that governments are instituted for the protection and happiness of mankind, and that whenever they become destructive of these ends it is the right, nay it is the duty of the people to alter or abolish them." If this sacred principle is recognised and acted upon, all must admit that the colonists of Texas have a clear right to burst their 'fetters', and have also a just claim for recognition as an independent nation, upon every government not wholly inimical to the march of light and liberty, and to the establishment of the unalienable rights of man.